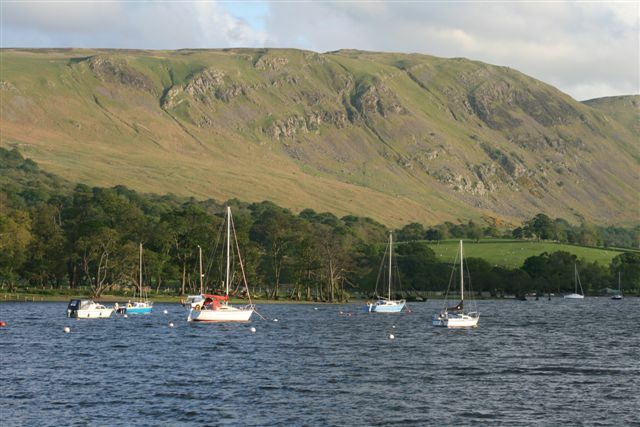 Ullswater is arguably England’s most beautiful of all the Lakeland lakes and is located within the heart of the Lake District National Park, Cumbria. 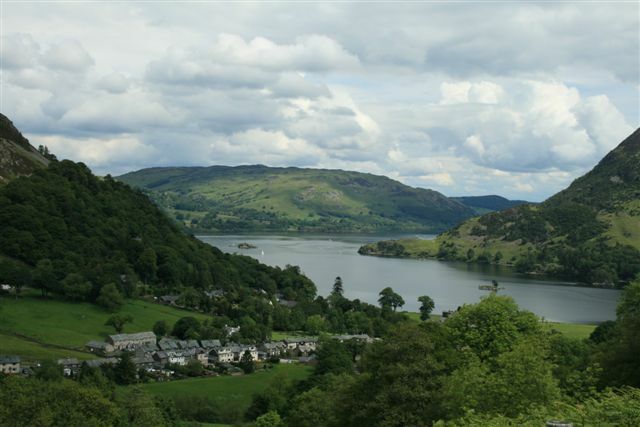 The surrounding area to Ullswater makes for a fantastic holiday destination and base camp with an array of great outdoor activities possible and available to experience and to suit all tastes and experience level. The pristine lake itself provides a huge range of activities and water sports, including sailing, kayaking, fishing boat trips and much more. Whilst the surrounding area has some of the best walking country in the Lake District, with nearby fells including Helvellyn and the famous ‘Helvellyn via Striding Edge walk and the easier and very beautiful Aira Force walk and waterfall, situated on the western shores of the lake and is well worth the effort to go visit. 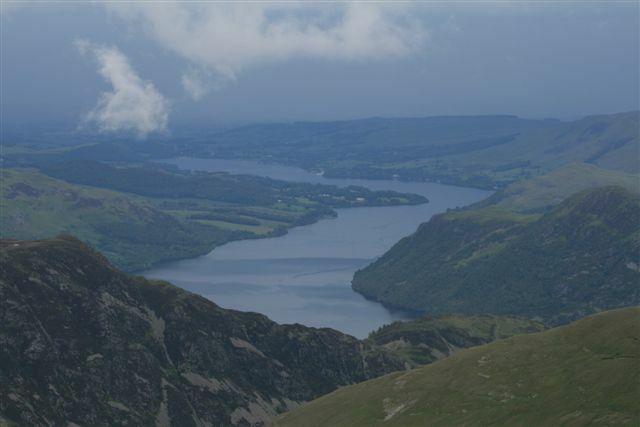 The Ullswater countryside provides a vast variety of walks from short ambles around the villages of Pooley Bridge and Glenridding and a browse around the shops to challenging hill walking. With local facilities to indulge a love of horse riding, you may take the strain out of seeing the beautiful scenery, or keep fit with some cycling or mountain biking for the more strenuous outdoor enthusiast. 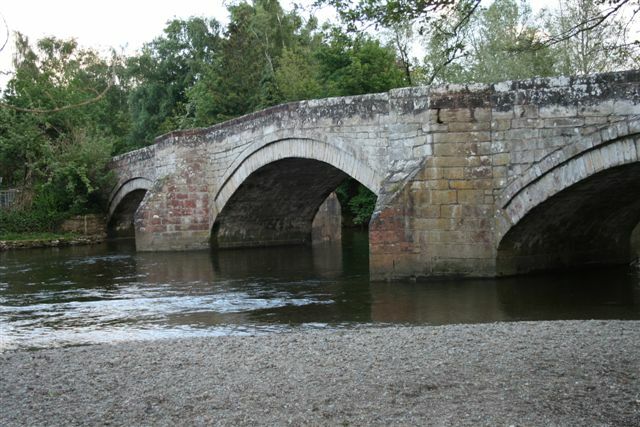 The village of Pooley Bridge is situated at the northern end of the lake, with its narrow 16th century bridge straddling the River Eamont as it flows out of Ullswater, as it is overlooked by Dunmallard Hill, which was the site of an old Iron Age fort. There are several foot paths around Dunmallard Hill and it is possible to walk to Dalemain country house and the village of Dacre (the famous Dacre Bears are situated in the village church yard) as a Pooley Bridge circular walk. Glenridding is a very popular village upon the shores of Ullswater, especially with mountain walkers, who can scale England’s third highest mountain, Helvellyn and many other challenging peaks from the village and with ample car parking. 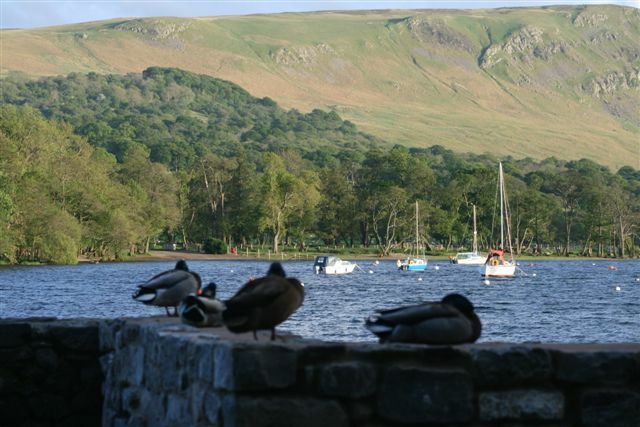 With the many varied villages and hamlets located around Ullswater, this the second largest of the Lake District lakes you will find such destinations as, Pooley Bridge, Glenridding, Patterdale, and with the picturesque hamlets of Watermillock and Howtown. All having their own individual charm and character which sets them apart from others. 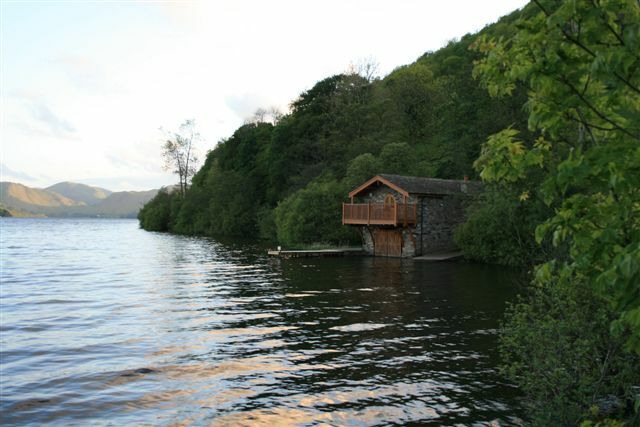 There is a wide variety of holiday accommodation available within easy reach of Ullswater, including lake side camping sites, log cabins, luxury lake side hotels, wonderful Bed and Breakfast, self-catering holiday cottages. The Quite Site campsite even has the new timber framed camping pods which are a great alternative to pitching your own tent, although with a great feel for the camping experience without the tent. Ullswater attractions include the Ullswater Steamer which offers trips around the lake calling at Pooley Bridge, Glenridding and Howtown. The Steamers operate an all year round service, being originally working boats which from the 1950 moved mail, workers and goods to and from the Greenside lead mine at Glenridding which closed in 1962. 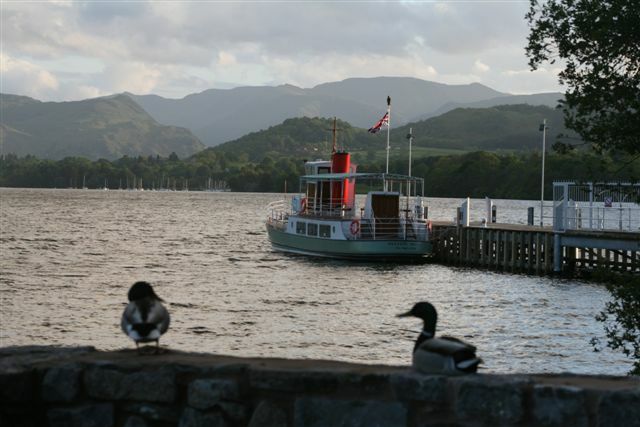 Today there are four steamers plying the waters of Ullswater, Raven, Lady of the Lake, Lady Dorothy and since April 2007 Lady Wakefield. 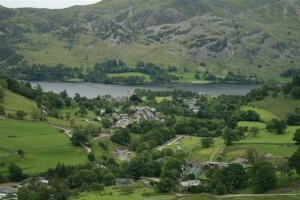 People often catch the ‘Steamer from Glenridding to Howtown and then return on foot along the lake shore to complete one of the most popular and scenic low level walks in the Lake District. 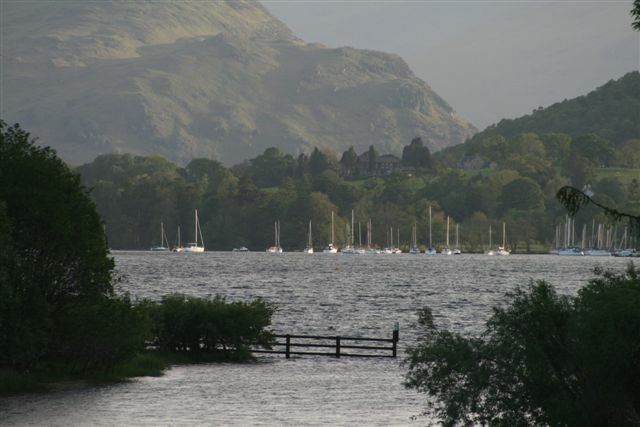 William Wordsworth in 1802 after visiting his friend Thomas Clarkson who lived in a house on the eastern shores of Ullswater was inspired to write the poem “Daffodils” after seeing daffodils growing on the shores of Ullswater on his return journey back to Dove Cottage at Grasmere. 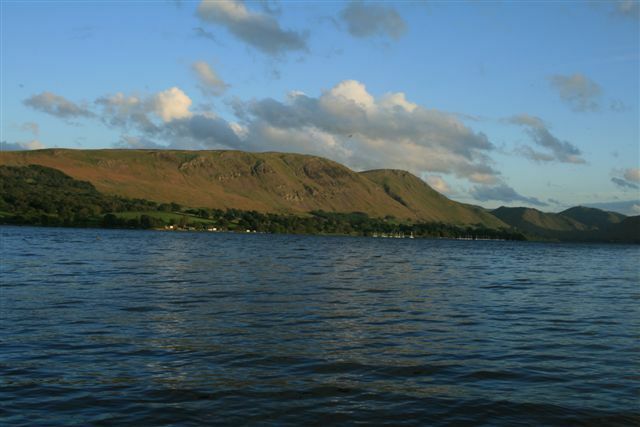 Wordsworth once wrote of Ullswater “it is the happiest combination of beauty and grandeur, which any of the lakes affords. 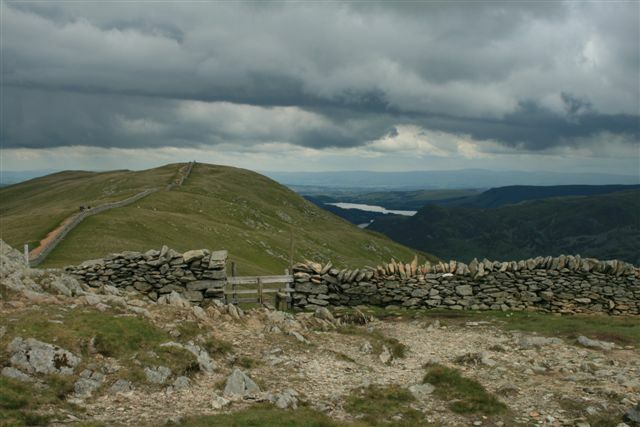 Helvellyn is most probably the most famous of all the Lakeland fells, whilst being the most visited mountain, and the summit we all wish to reach. 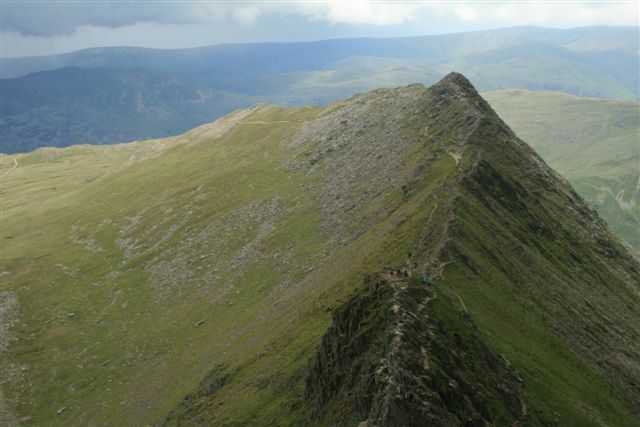 At an altitude of 3,117 ft, Helvellyn is the third highest peak in both the Lake District and England. That being said there is a magical aura attached to Helvellyn and Striding edge, even a sense of adventure when you set out upon this walk of walks. 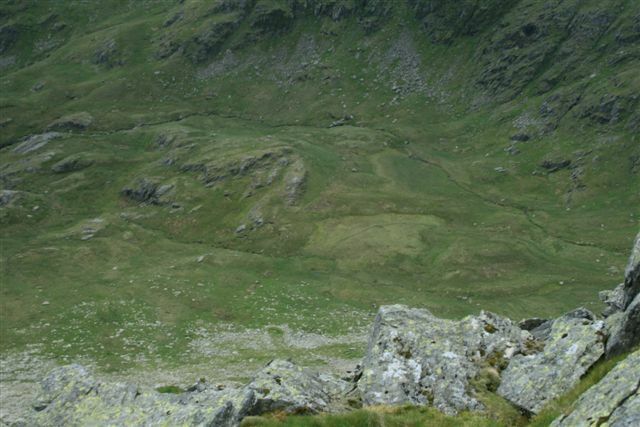 No matter where your starting point is, although Wainwright did state, “from the East, however, the approach is quite exciting” and it is with this exciting thought firmly fixed in my mind and adventure that I chose my route of Helvellyn via Striding Edge. At this point I do believe you need to know a little about the author as you may be using these meagre notes as reference for your own forth coming adventure to the summit. Being no seasoned aficionado of hill walking, rather an individual who loves to get outdoors and away from the day-to-day stresses of life. I believe this helps me to give a realistic view of this, and all my walks from a vantage point that is good for most of us out there who will set foot upon the Lakeland fells. For most, it is the adventure of walking Striding Edge to the summit of Helvellyn which creates such a stirring of emotions for the walker who is willing to set foot upon this route, with a memory which will endure. 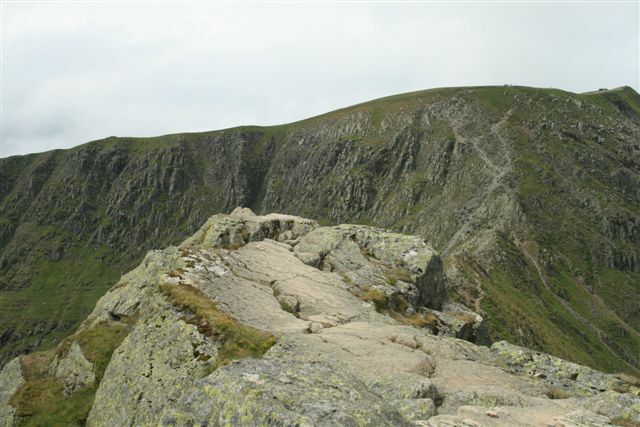 The route has developed some notoriety over time and it is this reasoning that prompted my commencement of this walk and to dispel and fictional untruths whilst giving my personal thoughts on Helvellyn via Striding Edge. This route to Helvellyn takes the Eastern approach starting from the village of Glenridding where there is a pay and display car park, although there is some free parking on the side roads, which is where I left my vehicle for the day. I started my walk by crossing Glenridding beck upon the footpath and passing the outdoor shop on my left as I walked along the road with the beck to my right. 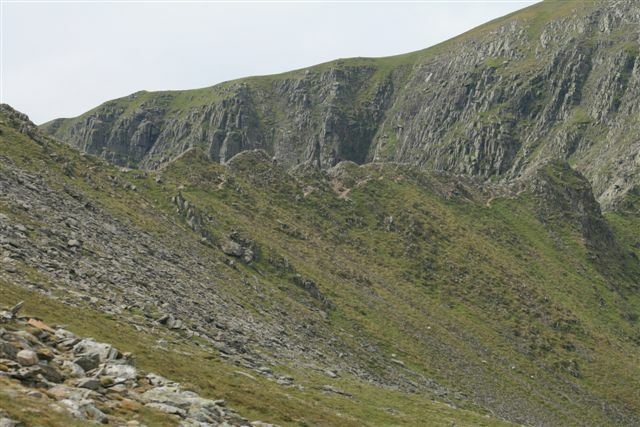 The road turns into more of a track and then you will see the first signpost on your left to Helvellyn. Taking this path and heading for Westside on the OS map continue ascending through the small wooded area and at the crossing of paths take the path to your left making for Keldas. 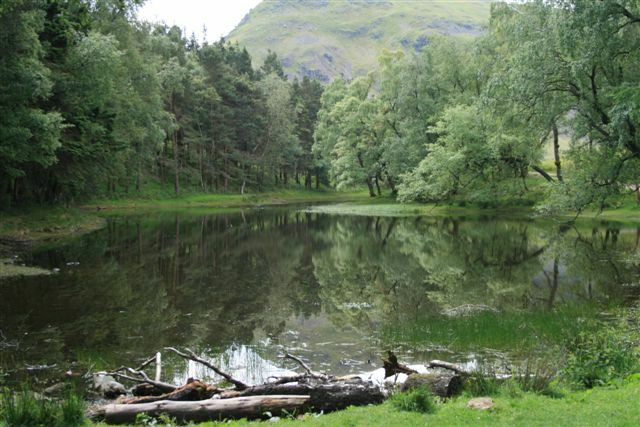 Here you will find a small picturesque tarn surrounded by trees. 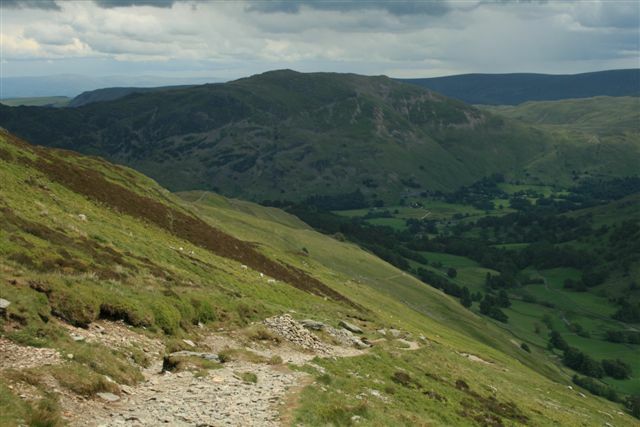 The footpath here is clear to see and easy to follow as your footfalls take you towards Kennels and the Helvellyn ascent route from Patterdale. From this point onwards the track is well maintained and easy to follow, a near straight line to our goal. 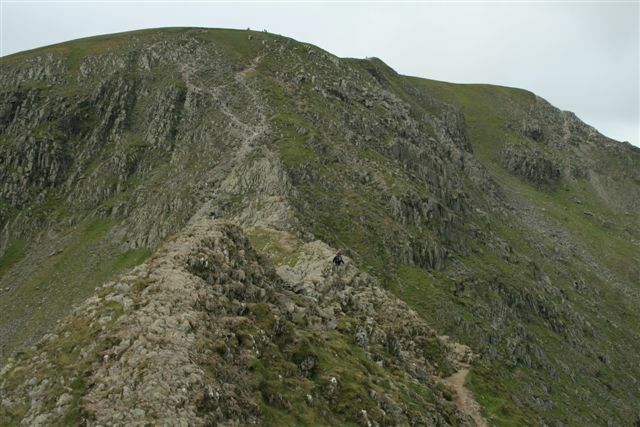 The ascent is gradual as you climb the Helvellyn range from Patterdale and for those with an eye for fells may recognise High Street on the not to distant vista. Simply stop, turn around here and take in the stunningly beautiful views as that’s what its all about. 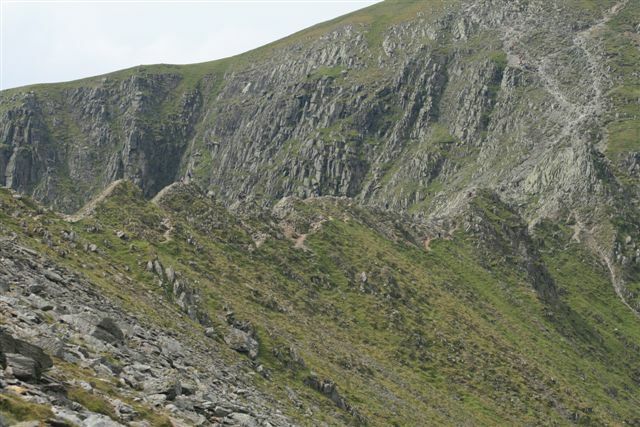 The wind can change; the weather with it and the trepidation of the walker grows as you come ever closer to the adventure of Striding Edge and the conquering of Helvellyn. Today I had fine weather as I climbed upwards and I was mindful of the changing weather and as my altitude increased I was presented with a wider view of the skies and the possibility of rain. I believe these changeable factors are what make any walk to Helvellyn and Striding Edge the adventure it undoubtedly is, with my apprehension building. Following the track upwards and coming into view you will see Eagle Crag and Ruthwaite Lodge before you reach Grisedale Brow and ultimately the convergence of two paths at a cross roads. 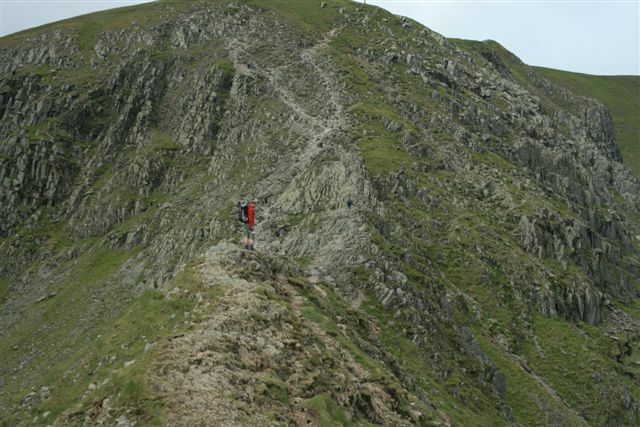 Taking the left hand route onwards and upwards onto the beginnings of Striding Edge with a great view of the summit of Helvellyn clearly visible now. 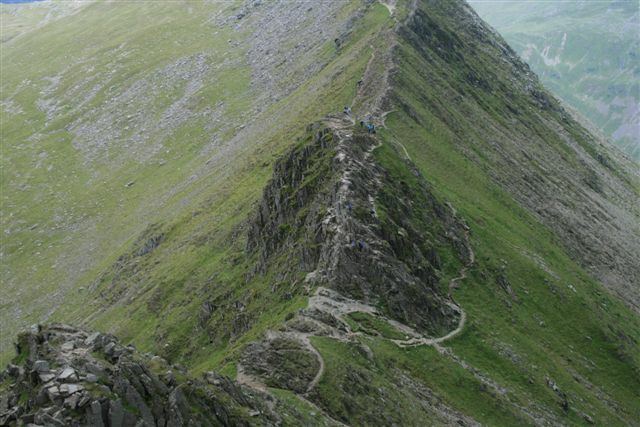 I was advised prior to my Helvellyn adventure that you could drive a mini over Striding Edge and now I found my self at the elevated starting point looking downwards onto Striding Edge. It is at this point I will say to each and everyone who reads this walk that, as in life there are many ways to circumnavigate any route, and yet again I am presented with variables here. 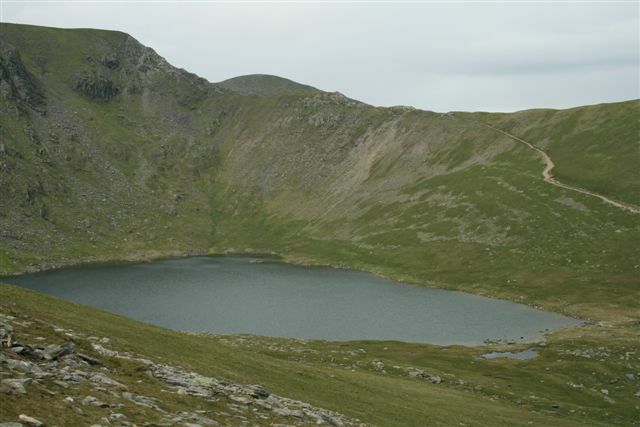 The summit of Helvellyn is within sight and if you can only imagine some great body with curved arms held aloft, this is a similar view that presented itself to me with Red Tarn encompassed within the arms. 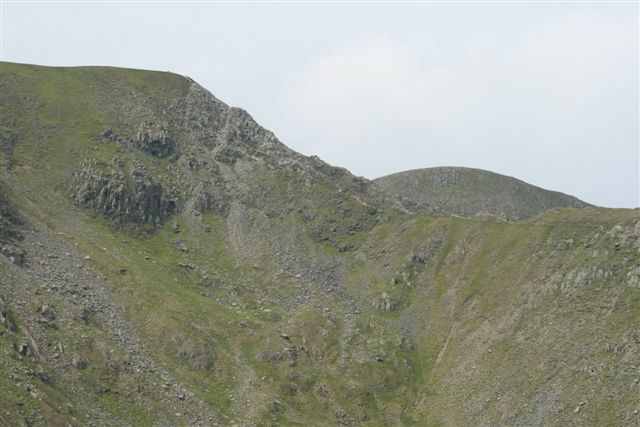 It was my aim to walk the arms in a clockwise direction with the summit of Helvellyn being the top of the head, so to speak. Helvellyn via Striding Edge can be a little daunting with drops on either side, although my advise here is to go at your own pace and simply make sure of each footing you make and keep walking. 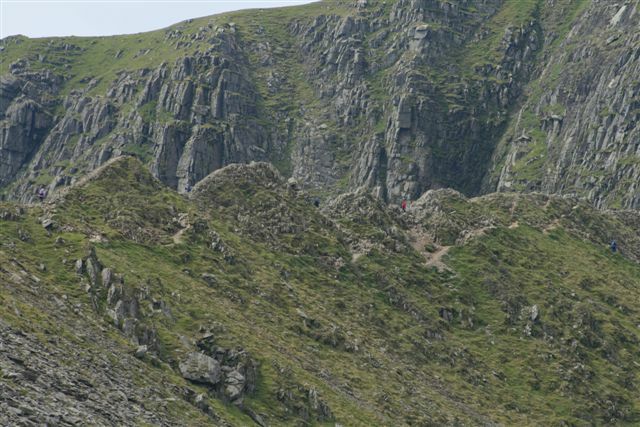 There is an easier route, although the route to take just draws you in and onto the tops like and adrenalin rush. 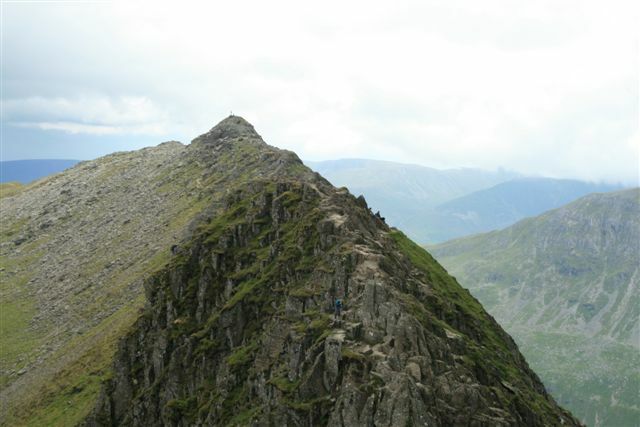 The incredible feeling of standing in the middle of Striding Edge at your full height is awe-inspiring to anyone and if it does not move you, you are on the wrong mountain. The rock is bare cold and exposed, even ragged and rough. The wind blows through your hair and you look for the route you will take with care and thought. This is no amble in the countryside of England, this is a mountain you are climbing and it sure feels that way, without doubt. 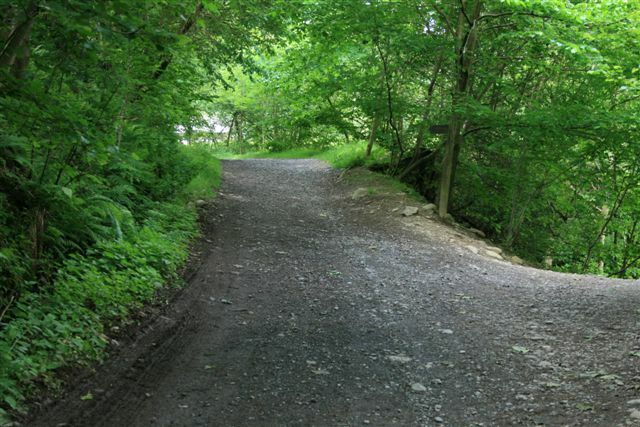 As a general rule the path is about three feet wide, although uneven and of unforgiving rock and I should imagine slippery when wet. With the surface being wet I would imagine this would add to the euphoria you feel when you complete this ascent. 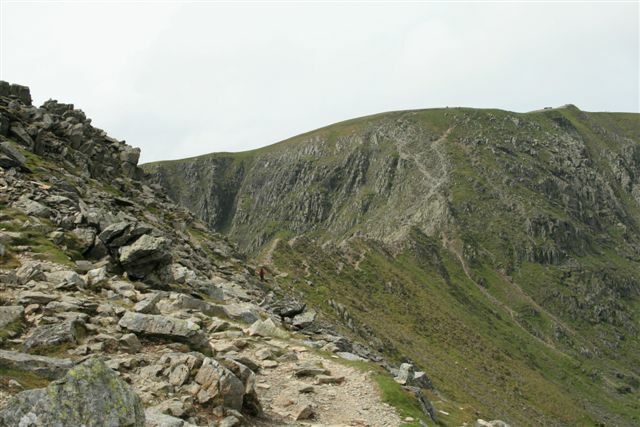 The walking Helvellyn via Striding Edge is the highlight of this walk having now completed it and writing about, although in my opinion the last section is the most difficult as you drop from the ridge with approximately a 8 feet drop of rock to navigate. Having my dog with me on this walk I have to explain that this was the most difficult part, whilst a fellow walker passed my Yorkshire Terrier down to me (Thanks). This being the end of Striding Edge for most, being the popular viewpoint. Yet in my opinion it is simply a reprieve prior to continuing on upwards. 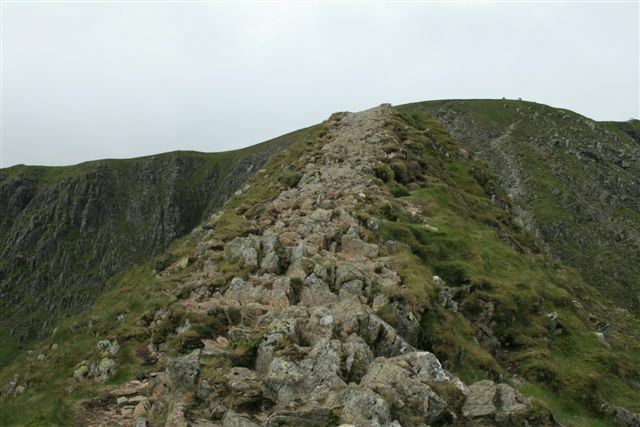 This then leaves the final assault on the summit of Helvellyn, to test your endurance and persistence, as this again is an arduous climb to the summit of Helvellyn. 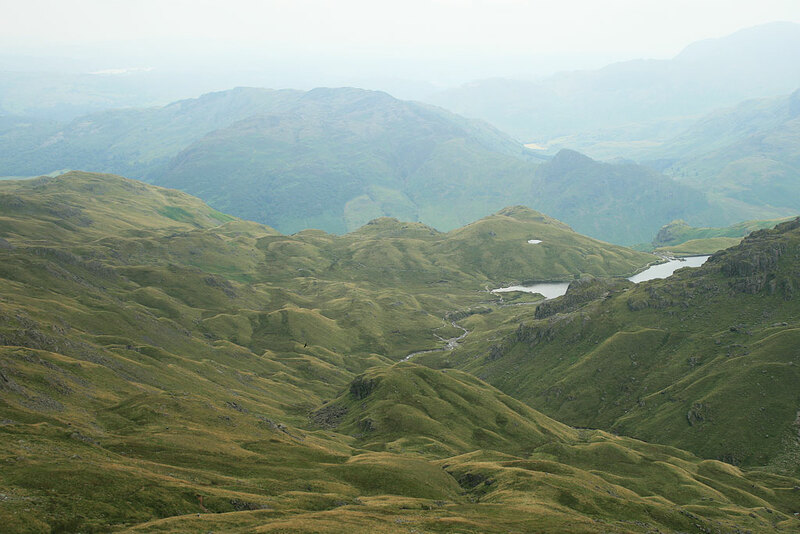 Your personal efforts are well rewarded once you reach the top with a clear view of the summit and having walked the finest edge in the Lake District. Is it dangerous you ask, and my simple answer to this question would be no, although treat it with the respect it deserves and if its windy us a different route. The famous wall-shelter is clear to see and a gathering point for lunch and discussion with those in your group or others who arrive. 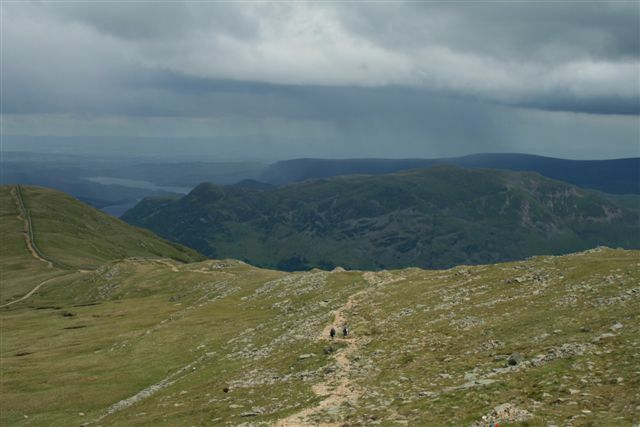 You will see from my pictures that I just made it to the summit of Helvellyn as the rain and cloud came in. Within a 30 minute spell it went from good visibility to rain and poor visibility and back to good once again. 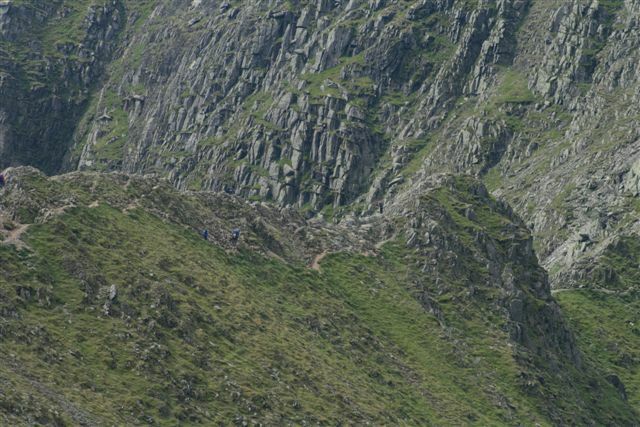 I hope this comes across in my pictures and video, although it did not stop anyone from crossing Striding Edge to the summit of Helvellyn and lunch. 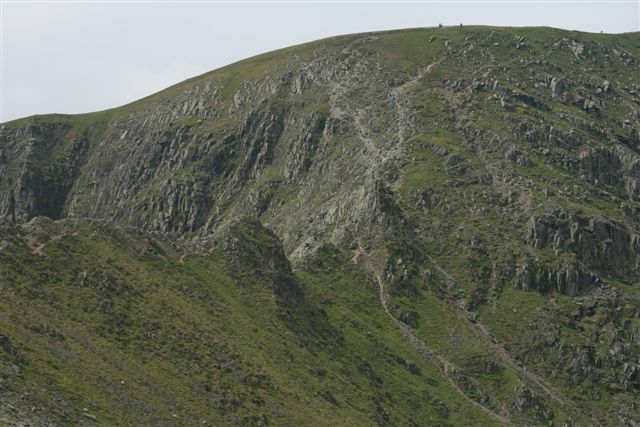 I left the summit of Helvellyn via Swirral Edge and here the path is good and clear. The footpath on the OS map takes you down via Red Tarn, although I decided to climb Catstye Cam and on a good clear day it is possible to see the Solway Firth. Descending from Catstye Cam I was off the track and easily rejoined the footpath in the valley heading in the direction of the old disused mines and Glenridding Beck and the route back to my vehicle. 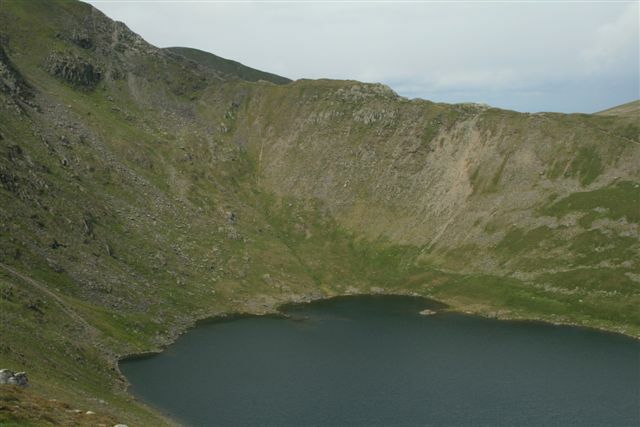 Should you wish to see better quality photographs of this Helvellyn Via Striding Edge walk please visit Helvellyn Via Striding Edge on our Lake District Walks Flickr account. 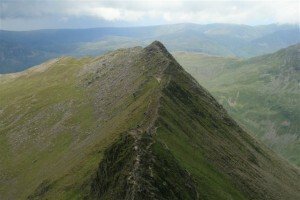 Please feel free to comment below on Helvellyn Via Striding Edge share or even hit the Face Book like button. 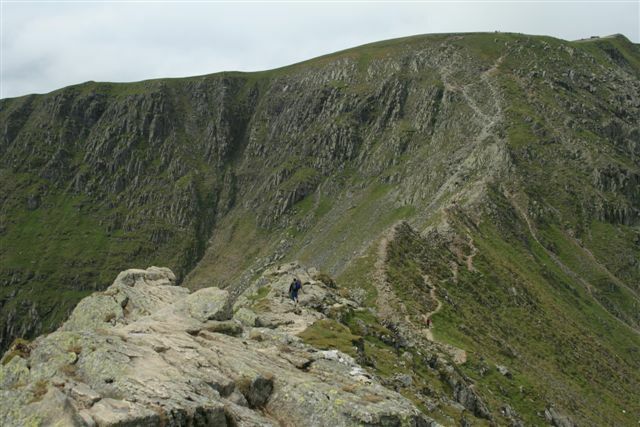 Helvellyn is a walk to complete time and again with renewed awe.